I know, I know, we haven't put nearly enough pictures online. Everyone keeps harping on us about it and I'm sure that from afar it's not as much fun to hear about the chaos without the proof, but let me tell you, part of the chaos is not knowing where the camera is, whether or not we downloaded the pictures, whose computer the pictures are on....okay, you get the idea. I've resorted to taking some pics with my Treo but if you look at the post from 6/2 you can see those results (yucch). 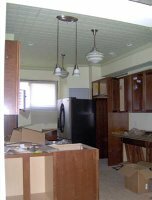 So - here are more kitchen pics, finally. You can see the tin ceiling and the light fixtures and sort of get a feeling for the paint colors in the kitchen (which is a buttercream on the walls and sage green (Martha's "Everyday Green") for the ceiling (and later trim)). I also think this is the first look for most people at the cabinets - "cherry spice" - pretty simple design, will be darker than the cork floor (which gets installed starting Wednesday this week). 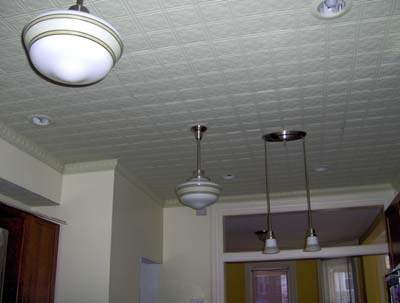 The light fixtures are from Rejuvenation, one of my new very favorites. Absolutely love their lighting, I could definitely do more damage and get fixtures for the LR/DR there....but I think we'll have to live with the Home Depot specials in those rooms for a while. On Friday Aaron started to lay the cement for the floor of the shower in the new master bath, so that Santana the plumber can make his triumphant return on Monday to finish everything up. 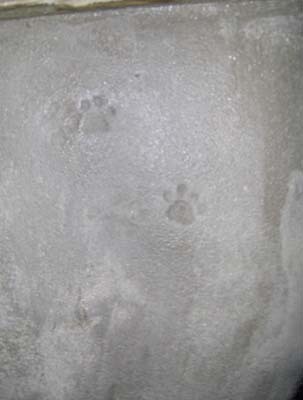 Just as Aaron was done with the cement, Joey decided to check it out. 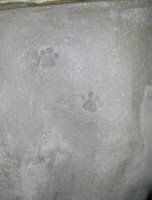 Comments on "More kitchen pics"
Pawprints! The lighting fixtures and cabinets look terrific. It's definitely starting to take shape.